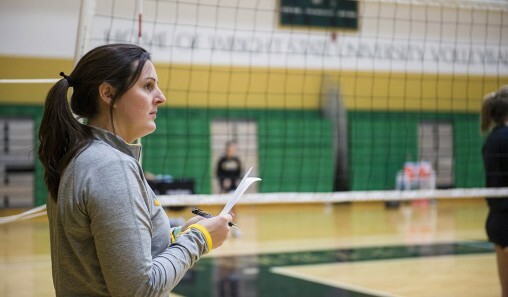 Wright State volleyball coach Susan Clements represents the dedication, competitive spirit and passion that Wright State coaches exemplify on a weekly basis. 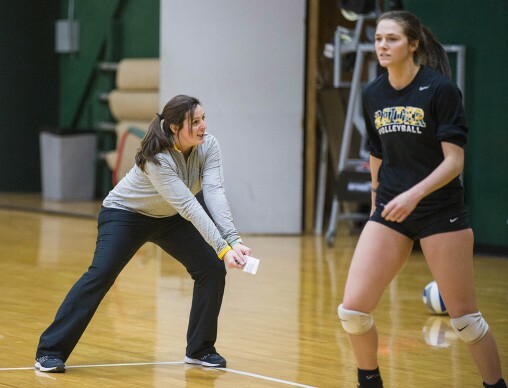 Clements has coached volleyball for 11 years, including five years at Wright State. She also serves on the American Volleyball Coaches Association, representing the Horizon League, and works with mentoring programs. Volleyball is a fall sport. During the off-season players practice and train. Depending on the day and time of year, Clements’ duties change. During off-season, she spends her mornings analyzing her student athletes during conditioning, critiquing form and providing advice on techniques. During the afternoon, she gives prospective players a tour of campus and the athletic facilities. Recruiting athletes is not an easy task. Clements may spend her weekends attending high school tournaments scouting players. It requires a lot of resources, energy, time and communication. Recruiters cannot contact a potential athlete until their junior or senior year of high school. The main thing Clements looks for is someone with a lot of character, energy, dedication and competitiveness, before checking the athleticism box. During volleyball season, Clements is busy checking in with her 12 to 16 players, keeping them accountable for managing good grades, scheduling classes that fit their volleyball schedule, attending study tables and setting team and individual goals. A rewarding part of coaching for Susan Clements is seeing her players grow and excel in their positions. Jessica Thornton, a sophomore team captain who plays libero, called Clements the team’s “mom away from mom” and an amazing coach. On the court volleyball coaches listen for communication among players, along with observing their serves, skills and techniques. They will later review practice tapes to analyze areas in need of improvement. “We’re going to push you out of your comfort zone, push you through it, and it’s going to be tough, but we wouldn’t ask you to do something we don’t think you can do,” Clements said. A rewarding part of coaching for Clements is seeing her players grow and excel in their positions. When that happens, she said, you can see the excitement on players’ faces. Susan Clements said an effective coach needs thick skin, unwavering determination and confidence. Student athletes balance the demands of coaches, professors, family, friends and of themselves. Working individually with athletes to create a cohesive team with diverse personalities is one of the challenges a coach must work through, Clements said. Wright State’s volleyball team isn’t all work with no play. Clements annually takes the team to a haunted house as a tradition. They also have a team retreat. During the team’s recent retreat, Garr battled Clements in a dance-off. To Garr’s surprise, Clements had a few moves of her own. Clements said funny moments happen often for her team. Clements comes from a family of coaches, including her uncle, cousin and mother. Seeing the different personalities in a coach — from rough and blunt coaches to softer and approachable coaches —influence how she works with her student athletes. Clements said an effective coach needs thick skin, unwavering determination and confidence.